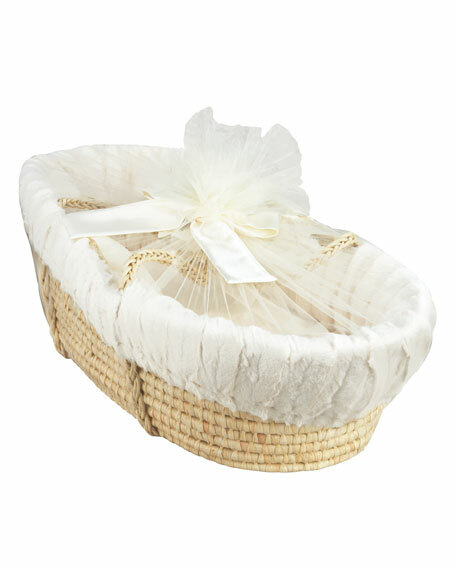 Includes plush bumper, 27" x 32" receiving blanket, mattress, and all natural basket made of woven palm leaves. Ivory. Arrives beautifully wrapped in tulle with a large satin bow. 34"L x 17"W x 8 1/2"D. Not for use with babies over 20lbs. or for babies who can crawl and/or sit up unassisted. Not recommended for carrying baby. Polyester. Handmade in USA. Machine washable; dryer safe. Grevi trapper hat in faux-shearling (polyester/cotton/acrylic). Flaps extend over ears. Grip-strap closure. Short, curved soft brim. Made in Italy. Kissy Kissy baby hat from the SCE Animal Cracker collection. Rolled cuffs with petite alligator embroidery. Fitted style. Pima cotton. Kissy Kissy baby hat from the SCE Animal Cracker collection. Rolled cuffs with petite alligator embroidery. Fitted style. Pima cotton. Made in Peru.